You’ve got a date for Sunday Morning Brunch, and need a new look. What River Oaks District retailer are you hitting up first? Fine Italian design and sharp leather goods are a magical combination at Canali. Besides, it would be fun to share some of my style and match accessories with dad. What’s your number one fashion ins-fur-ation? I really admire the fashion from South Korea and I am super excited that brands and styles are crossing to the US more and more. Kim Woo Bin is one of our top fashion ins-fur-ations. You are paws-itively adorable! What’s your favorite photo-shoot spot in H-Town? Thank you! We like to explore the murals around H-Town; it’s a great way to get to know new parts of the city and make new friends. We also like to visit Hermann Park and Discovery Green. We even got to meet First Lady Barbara Bush when we first moved to Houston once when she was walking her maltipoos. Your hair is always puparazzi ready! Give us the rundown of your grooming routine. There is a lot of work that goes into keeping my hair clean and free of mats. When it is bath time, which I admit is not my favorite day, my grooming routine consists of shampoo, conditioner, detangling spray, and to ensure good hair flow, a blowout. I also like to get blueberry facials to keep my face feeling, looking, and smelling fresh. What treats get your tail wagging? Stella & Chewy’s Wild Weenies Red Meat Recipe always gets my tail and whole body wagging! This is mom’s secret for photoshoots when I am distracted or a bit tired. At what point did you realize you were meant fur Instagram stardom? I am just having fun exploring our town but I would have to say it was when someone posted a photo declaring that I was Laura Dern’s dog doppelganger… and she confirmed! It was so fun to get contacted from many publications and even hear from relatives abroad. Spring is a great time of the year for puppy playdates. What’s your favorite dog park in the city? Levy Park and Tanglewood Park are our favorite! Most of my friends are Shih Tzus and Levy or Tanglewood are good spots for us smaller dogs to walk around. There are also many furiendly restaurant patios nearby so we can enjoy a relaxing post-walk brunch too! What’s a toy that you’d never be caught dead without on a puppy playdate? I think I enjoy the classics here. It’s hard to beat a tennis ball. Even though I like watching dad play with regulation sized ones, they are too heavy for me! Kong makes small tennis balls that fit nicely in my mouth and are great for playing fetch and hiding under the couch for safe keeping. You’re a natural behind the camera. 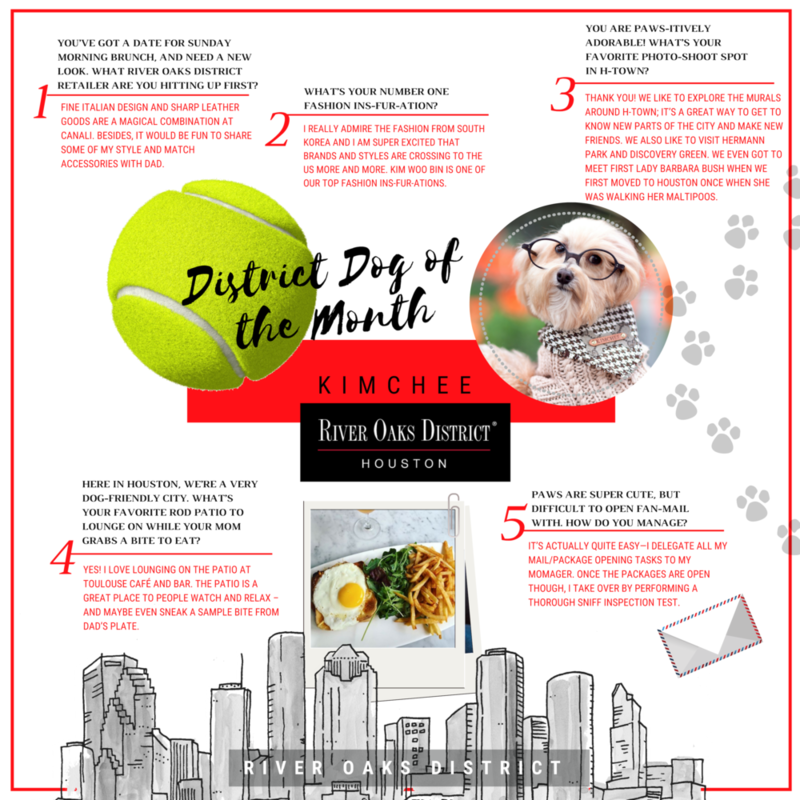 What tips do you have for bloggers around Houston looking to purfect their photoshoots? We like to plan things in advance. Light is very important so we like to get out early in the morning or close to sunset. If I am trying new clothes or poses, mom practices with me at home during the week. Taking long walks also help me to stay relaxed and ready for the camera. And, of course, delicious treats never hurt. Spring means that bright Texas weather is right around the corner! Any advice for picking a fetch(ing) pair of sunglasses? Spring is the absolute best! There are flowers to smell everywhere and the warm patio weather is unbeatable. But back to the topic of sunglasses because mom is very protective of my eyes. A good pair of sunglasses will always combine design and function. For optimum visual clarity, polarized sunglasses with 100% UV protection are needed to protect the eyes. Round frames are making a comeback and can give your outfit a cool vintage vibe. Here in Houston, we’re a very dog-friendly city. What’s your favorite ROD patio to lounge on while your Mom grabs a bite to eat? Yes! We love that Houston and Austin are remarkably dog friendly; they even passed S.B. 476 to further cement that reputation. I love lounging on the patio at Toulouse Café and Bar. The patio is a great place to people watch and relax – and maybe even sneak a sample bite from dad’s plate. You and your mom are absolutely inseparable. What’s your favorite way to relax together when you’ve had a ruff day? I am happy anywhere as long as I am with mom. After a long day of work and play, I really enjoy cuddling on a comfy blanket and watching Chef’s Table on Netflix with mom while she enjoys Thai takeout. We have also tried Doga (Dog Yoga) with Yoga and Hops together and – no surprise here – I was an amazing partner! Paws are super cute, but difficult to open fan-mail with. How do you manage? It’s actually quite easy—I delegate all my mail/package opening tasks to my momager. Once the packages are open though, I take over by performing a thorough sniff inspection test. We see so many shots of you in front of a tasty snack. Do you ever get a bite in?